The following post first appeared on El Pasajero, Metro’s Spanish-language blog. It was written by Maria Luisa Arredondo and has been translated for The Source. The place is small, modest and colorful — and sits in a perfect location next to Mariachi Plaza in Boyle Heights, where it’s easily accessible via the Gold Line. The best thing about Santa Cecilia, however, is the exquisite Mexican food that is undoubtedly the most authentic that can be found in Los Angeles. The menu basically consists of tacos, burritos, tortas and various combinations of those items. You can also order beef broth or chicken and Saturday and Sunday many area diners willingly come to enjoy transitional fare. All dishes include rice prepared with tomato sauce and beans. The secret, according to owner Armando Salazar, is that all soups and gravies are prepared daily with fresh ingredients. The tortillas are handmade, as are the moles and sauces. 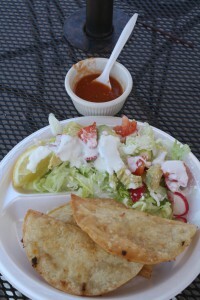 The tacos, either chicken or potato, are served with a green salad and salsa. Among the house specialties are beef with cactus, pork ribs with tomato sauce and barbecue beef with a savory sauce made with red chiles, cumin, garlic, cloves and a little vinegar. The prices are very cheap and the service is excellent. 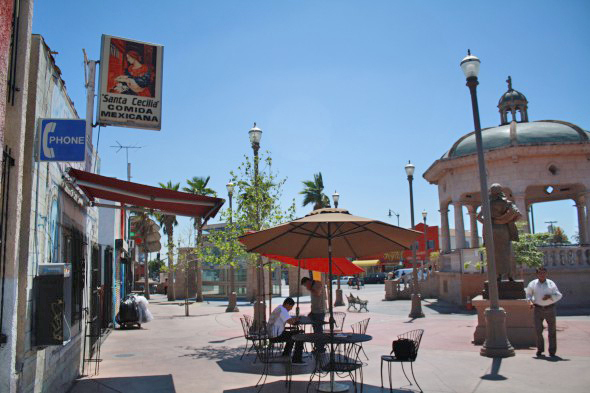 For those who prefer outdoor dining, the restaurant has several tables equipped with umbrellas, from which you can enjoy the view of daily life in Boyle Heights. The restaurant, established in 1994 and named in honor of St. Cecilia, the patron saint of musicians, has received several awards including one from the city for its contribution to the area’s economy and commitment to Mexican food and mariachi music. This sounds delicious! I always use this line when I go to work in the morning but I’ve never stopped by here. I will definitely go now that I know how good it is! This review has made me hungry!